For the last week I have been hosting a group of the BEST EVER women. They are five members of my stateside book group. We have been together for nearly twenty years. And good years they have been. I’ve missed going to the get togethers very much so I was really looking forward to seeing them and showing them around our neck of the woods. 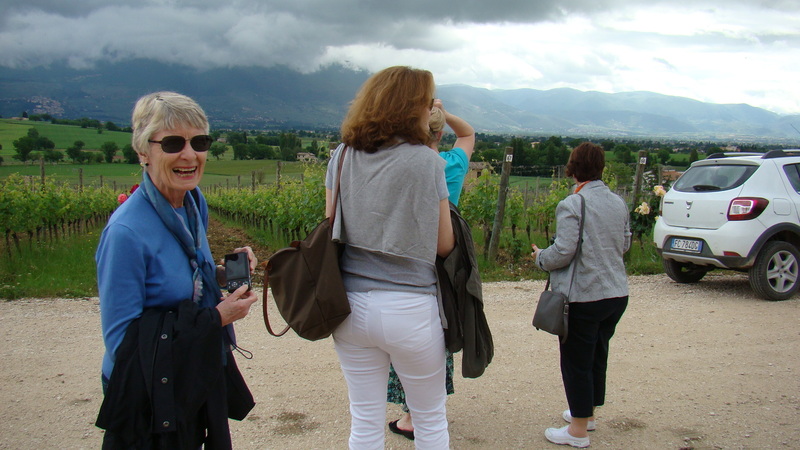 The original criteria for joining our group were: being in close proximity to one another, and you must love to cook, eat, drink wine and read. Since we formed we have been through marriages, divorce, the births of four children and retirements. Some of us moved away. One to Los Angeles, one to Naples FL, one to Maryland (so still close-ish) and me to Italy. The five who came are from CA, FL, MD, and two from Virginia. 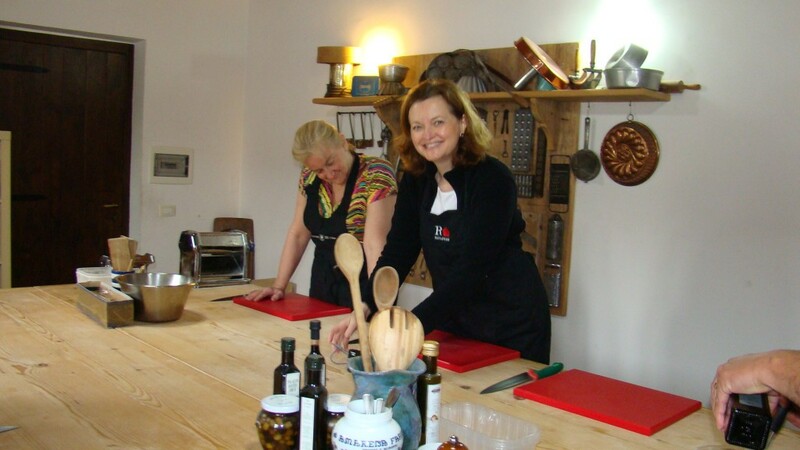 Because we are food and wine oriented my planning included good places to eat, a wine tasting and a cooking class. We picked them all up at the Rome airport after renting a car big enough for seven. 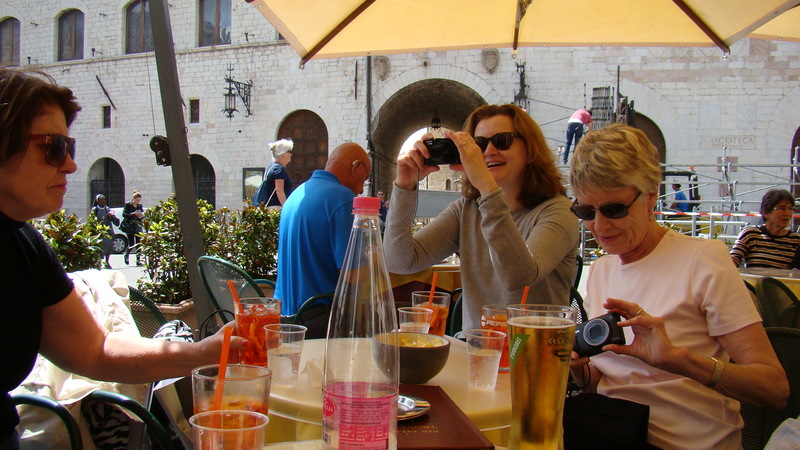 We caravanned to Montepulciano the first day for lunch at La Grotta. It was a good first lunch. Then we drove the two cars to Calagrana where we were staying two nights. Ely was the perfect host for our group for the entire stay there. Luigi, our driver AKA Luther my other half went home to take care of the cats. The group had a light dinner at Calagrana that evening and it was good as ever. 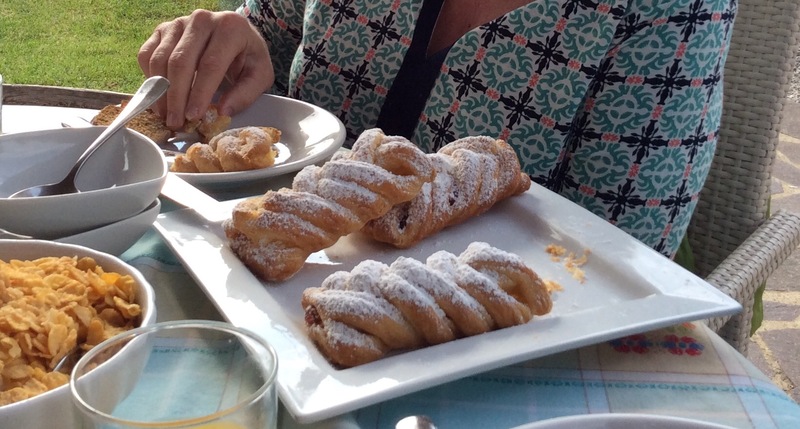 Breakfast at Calagrana – homemade pastries! 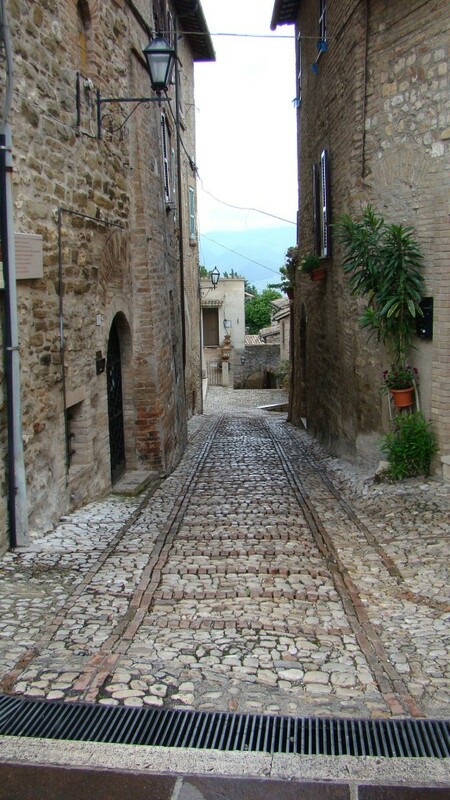 Sunday we drove to Umbertide and picked up Luigi and drove to Perugia to do some touring. We took the MiniMetro up into town. Afterward we drove to Roncolfo to eat at one of our favorite fish places. It was Mothers Day so crowded and slow but we had fun…and four bottles of wine! The food was good. We drove back to Calagrana and had a picnic of prosciutto, cheese and bread. They serve only lunch on Sunday there. The five in Perugia. Pam is behind Melissa. Sorry Pam! 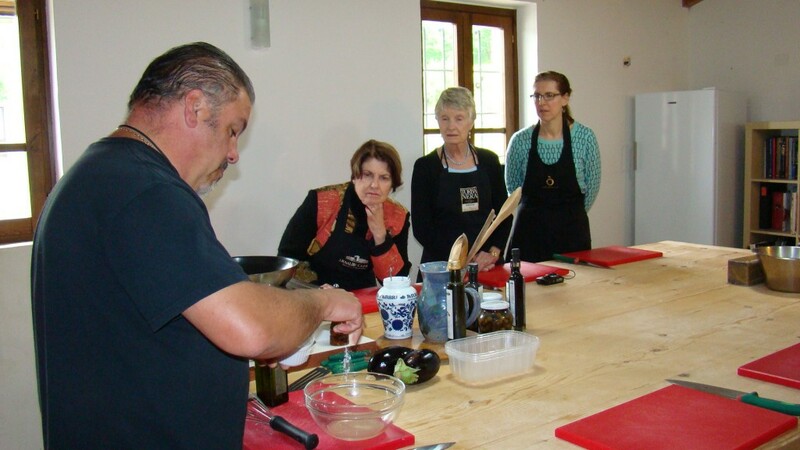 Monday I had arranged that we have a cooking class with Alberto, the chef at Calagrana. It started at 10am. Pam and Mitzi, ready to work. Lynn, Ellie and Melissa watch attentively. We first prepped the eggplant for the ravioli. 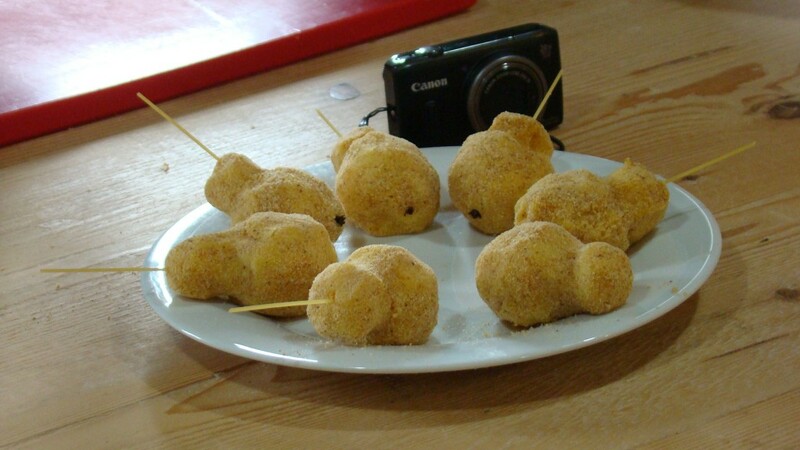 We created a dice which was fried and then added a prepared, roasted eggplant into the mix and some Parmesan cheese. It was the essence of eggplant! We then took some mashed potatoes which were mixed with flour and tossed it in our hand to make a ball. We then used the side of our hand to make a little knob which made it resemble a pear. To finish the illusion we took a clove to be the end of the pear and a piece of spaghetti to be the stem. 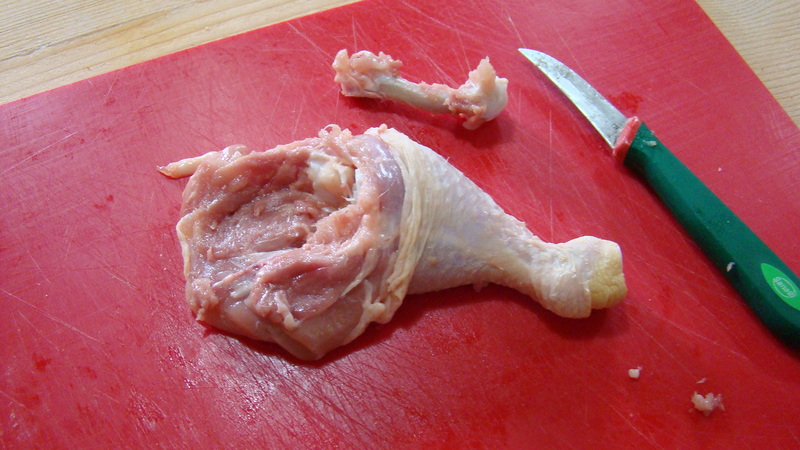 This would be deep fried as a side for the chicken. 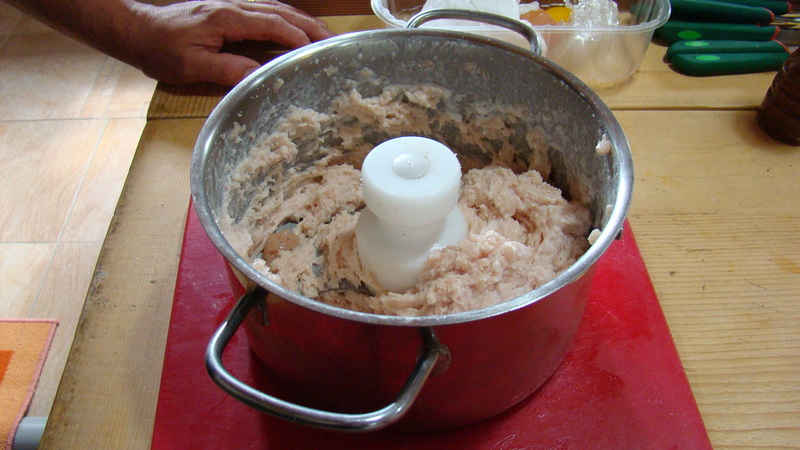 We then prepared a mousse of chicken and truffles to stuff the upcoming chicken leg. 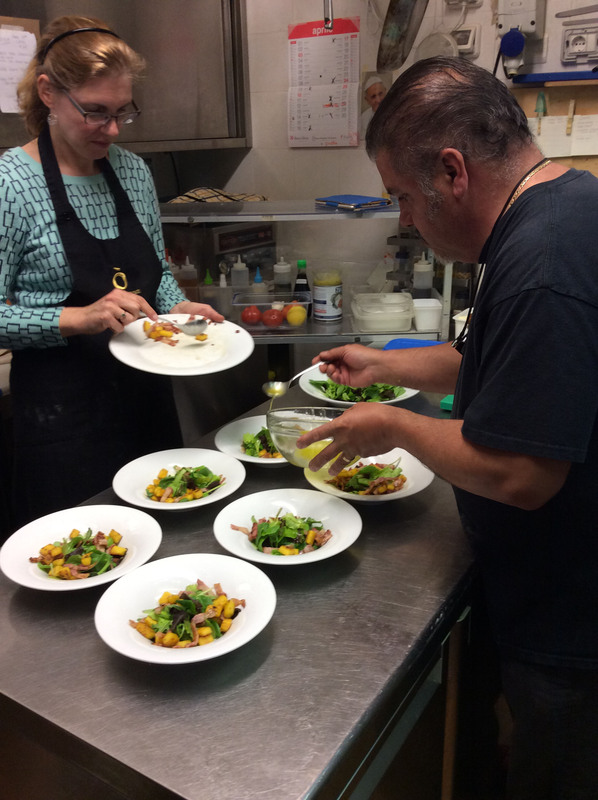 We started the makings of a warm salad of greens, a lemon and oil dressing, chicken livers and polenta croutons. 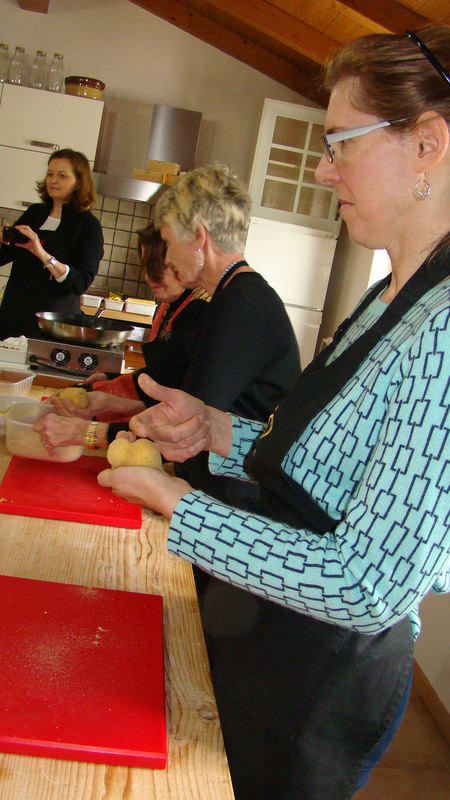 Chef showed us a bunch of uses for polenta to include polenta lasagna. Good for gluten free folks. 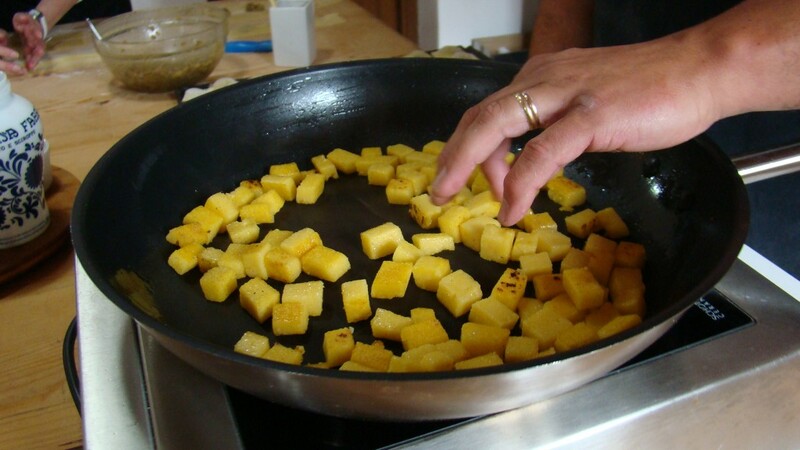 For the salad we were going to make polenta croutons (below). 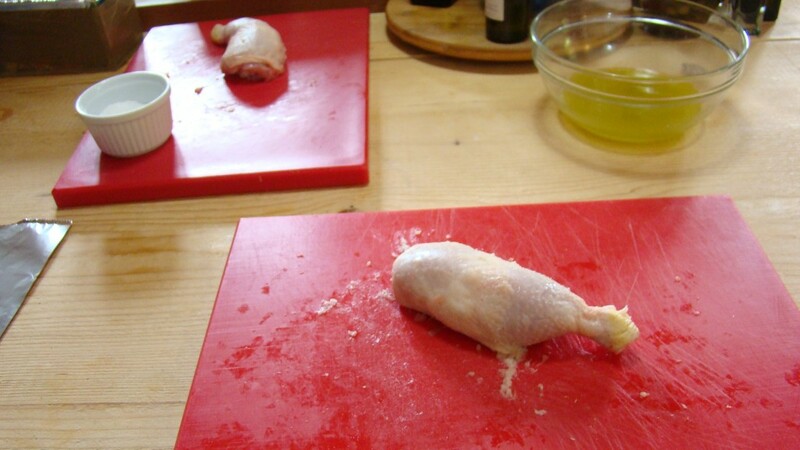 We next learned how to debone a chicken leg and stuff it with the mousse. We dipped it into oil and salt and pepper and rolled the finished product in aluminum foil. It was baked for 30 minutes and would hold in the oven for two hours making it a nice dinner party entree. 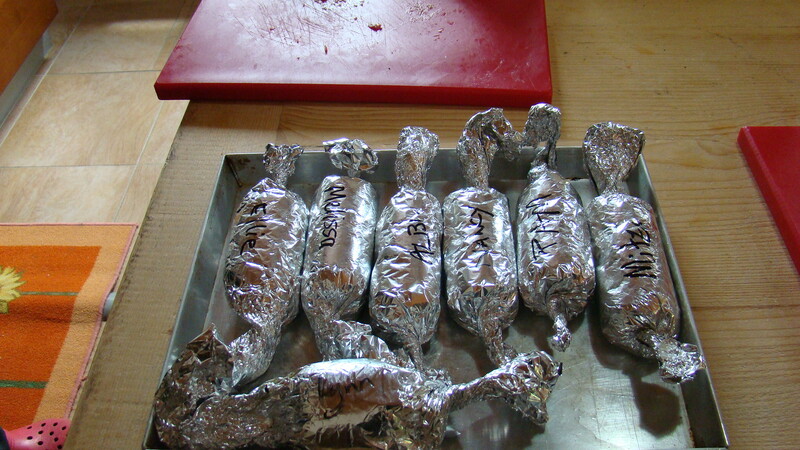 Legs rolled in aluminum foil and labeled with our names. We each will eat the one we made. 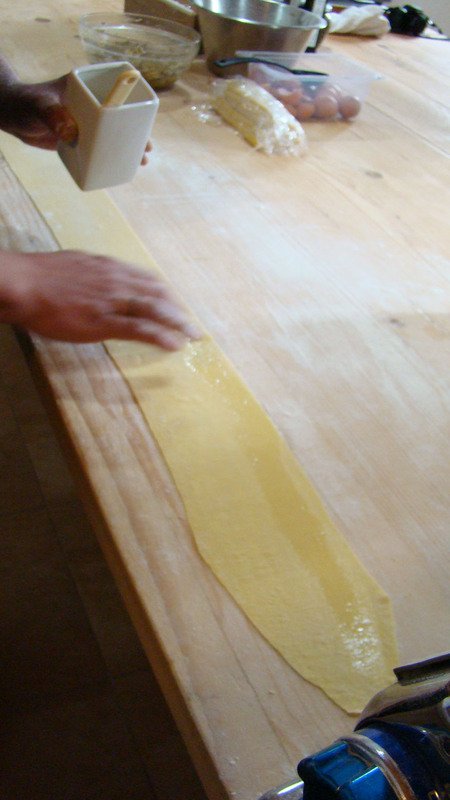 Next we made pasta. 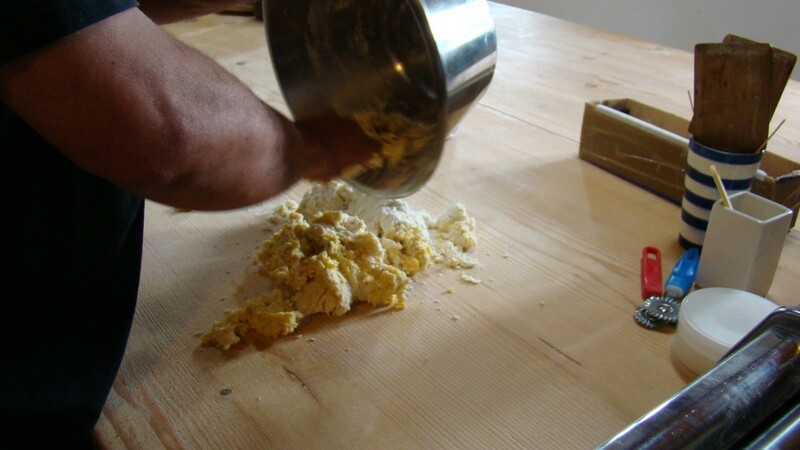 Alberto does not create a well in flour and incorporate the egg as we previously had learned. He uses a bowl and kneads it into the flour until a dough forms. 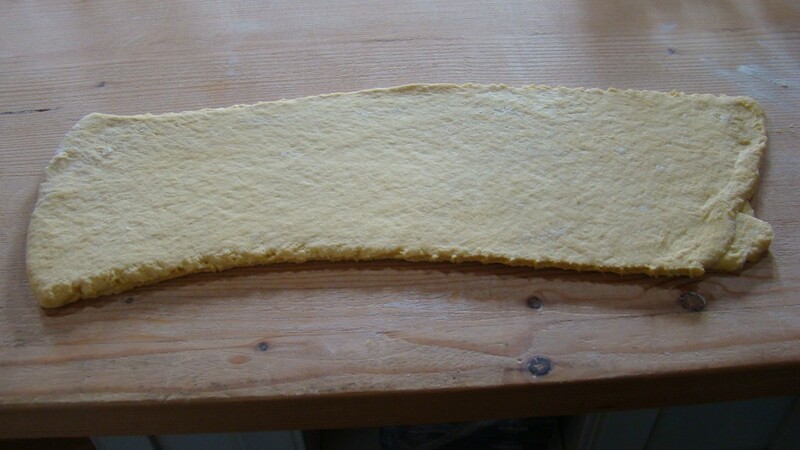 After he runs the dough through the pasta machine at high setting to knead it. Never leave dough unwrapped or it will dry out. 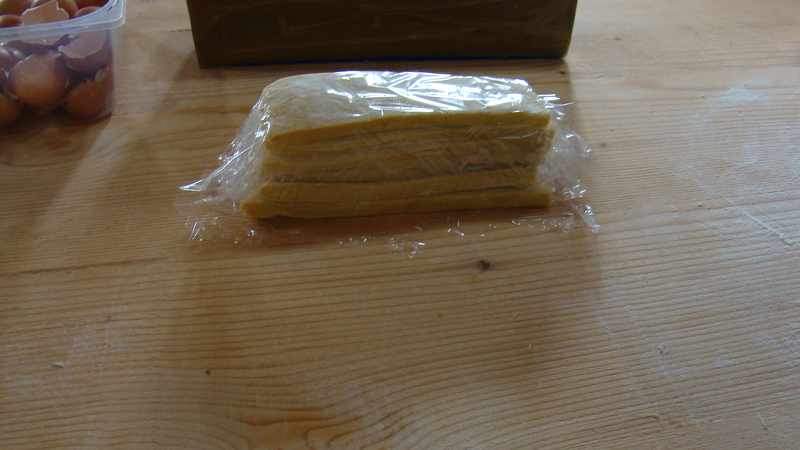 Wrap in plastic wrap. We did hands on finishing it up using the manual pasta machine. We learned how to make many shapes and how to freeze them for future meals. 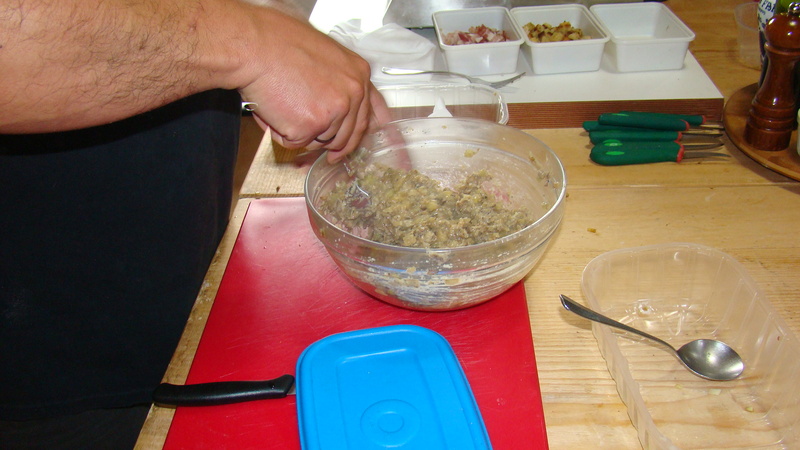 Chef Alberto is all about making a large amount if you are going to the trouble, then freezing it. 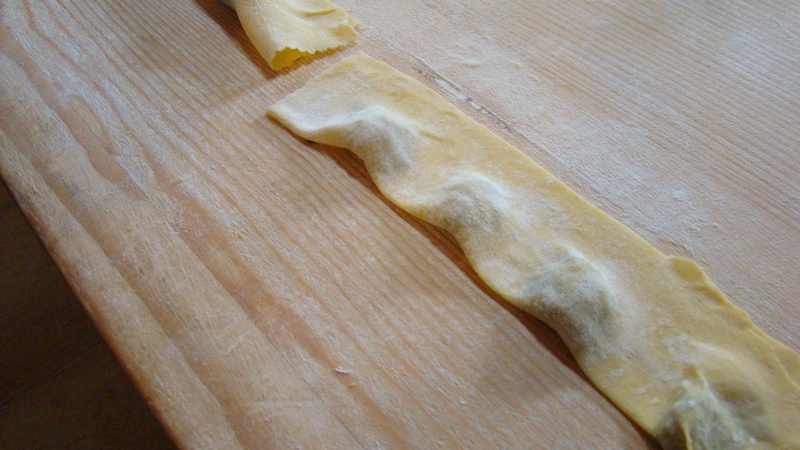 We made eggplant ravioli and Chef flash froze it before cooking. He says all pasta should be frozen and not thawed before cooking. Just toss the frozen stuff into the boiling water and return to a boil and it will be done. 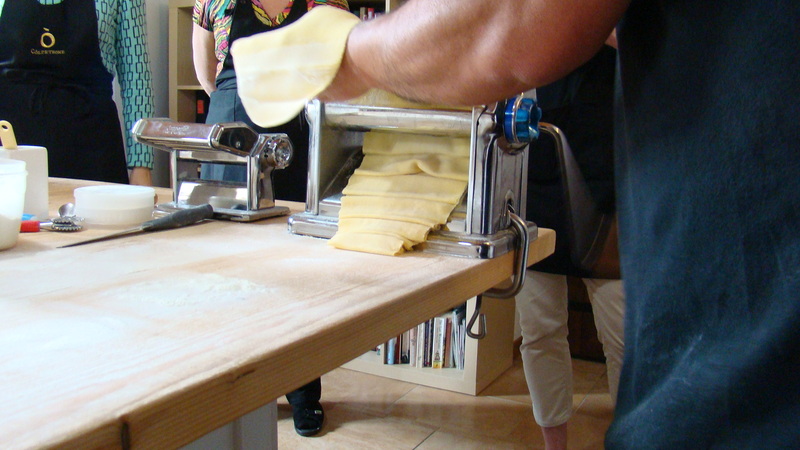 Chef Alberto demonstrates how to roll the pasta on the machine. 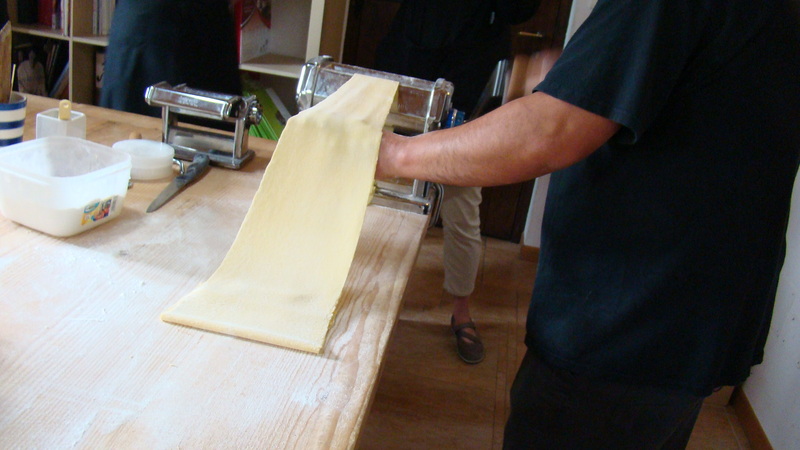 Do not take the pasta out of the machine as you roll it. 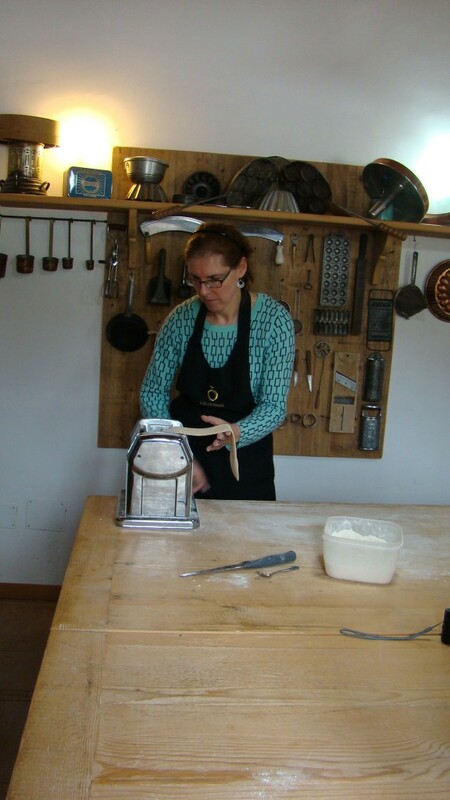 If properly floured it will not stick together. 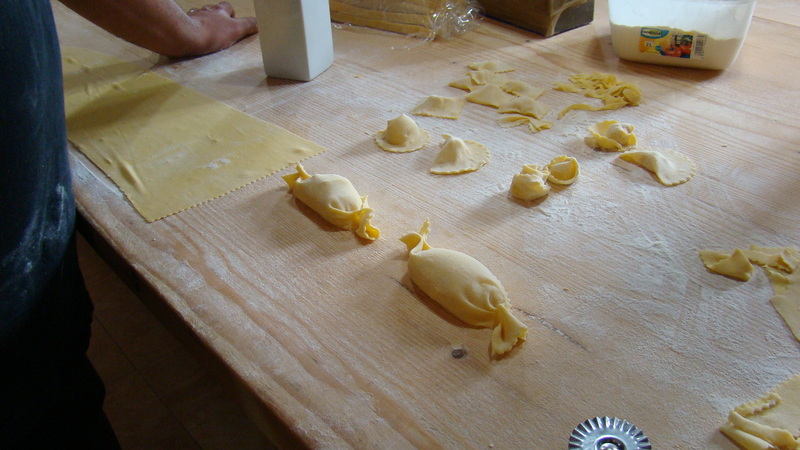 Ready to make any shape of pasta. This will be ravioli. Chef wets it with water on one side. The eggplant goes about 2 fingers apart. Only make four in a row and then space. Easier to work with. 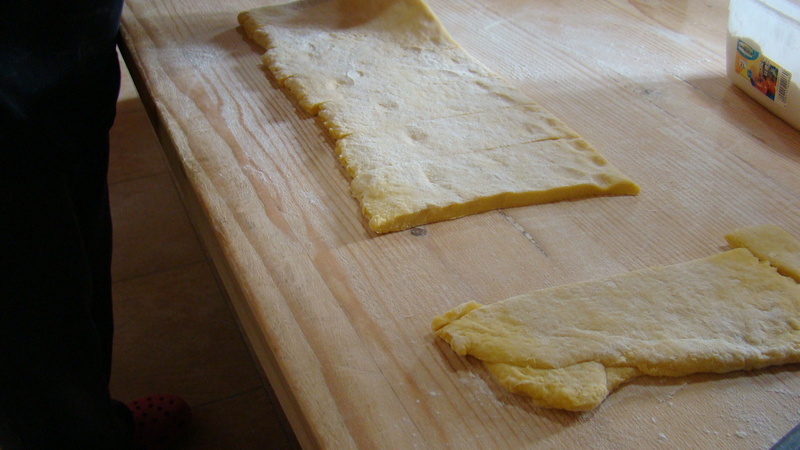 Fold the dough across and press lightly. Form into packets. Now it’s our turn to try. 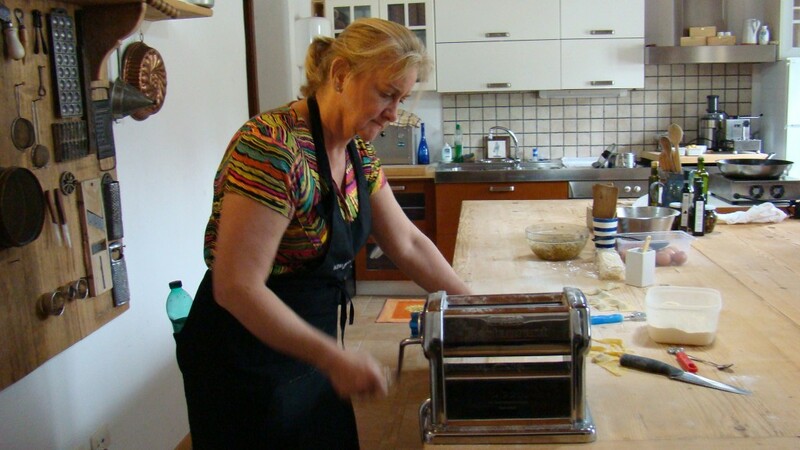 Ellie manning the pasta machine. Melissa gives it a try. Lynn with Ely looking on. Melissa makes her ravioli packets. Pam carefully folds the dough over her eggplant. Finally it was time to finish and eat! Alberto sautéed the polenta croutons with pancetta until very brown and crisp. Meanwhile he sautéed the chicken livers. 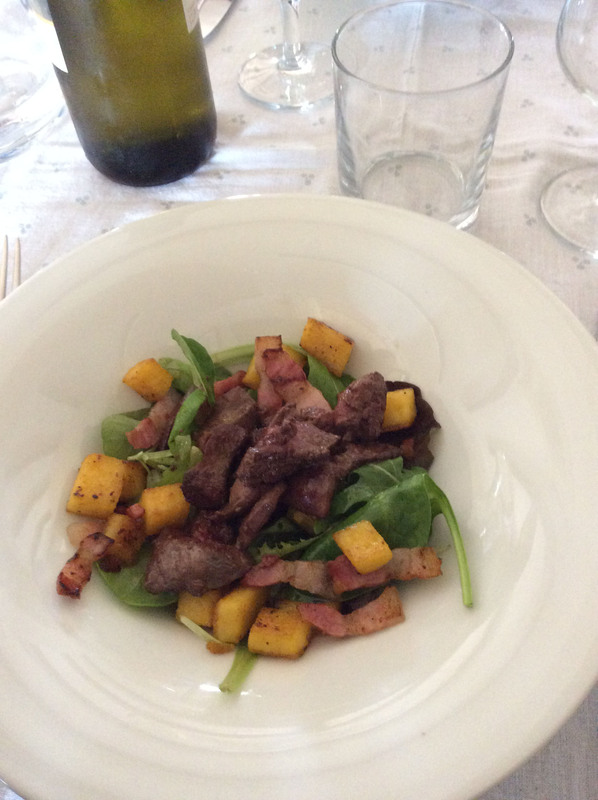 The warm croutons and chicken livers topped the greens tossed in the dressing. So good! 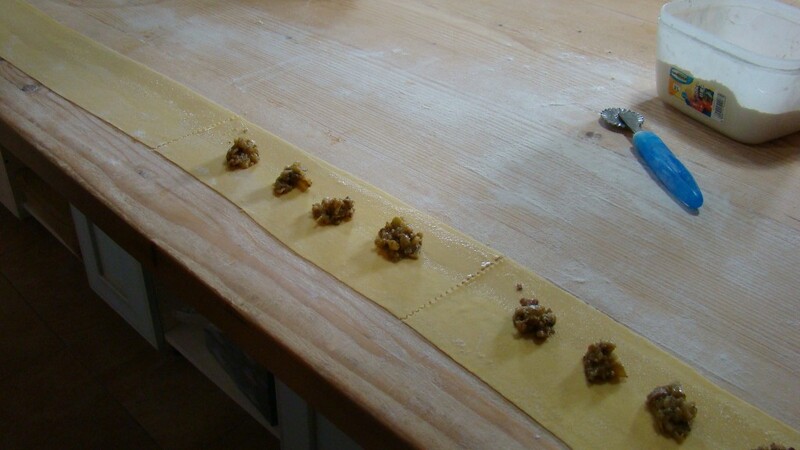 Then we created a simple browned butter and thyme sauce for the ravioli. 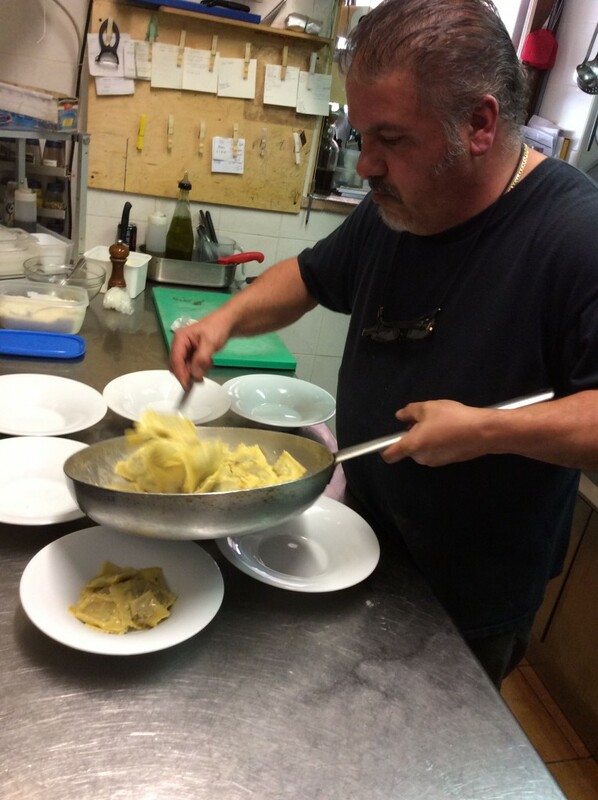 Chef tossed the now-frozen ravioli into boiling water and returned it to a boil. Then he tossed it into the browned butter sauce and tossed until finished. Sublime! 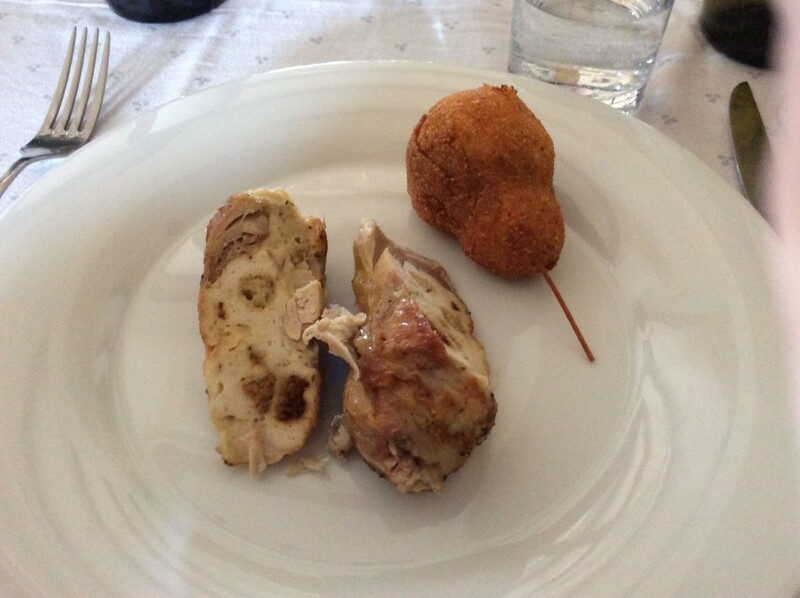 Finally the chicken legs which had rested for around two hours were ready and they were sliced through to show the stuffing and were plated with the deep fried “pear” apples. We were stuffed! 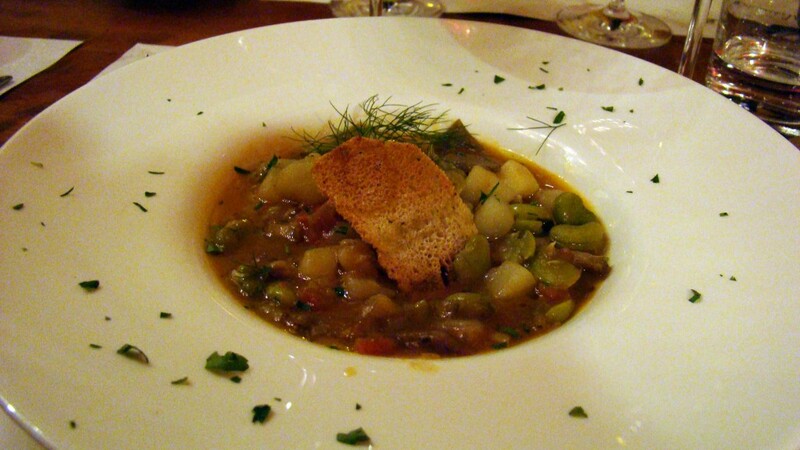 Salad of warm chicken livers and croutons. Chicken and “pear”, plated and ready to eat. 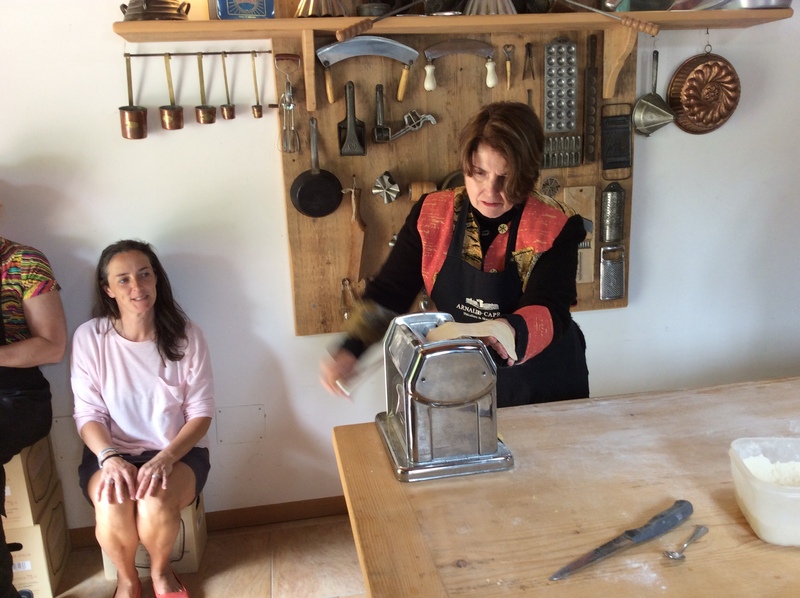 We headed down to Umbertide and took everyone to their accommodations. We had the use of a little apartment on the piazza just next to our house. Three of our people stayed there and endured the 68 steps up. The other two came to our house. This evening we began our Aperol spritz tradition. It is a nice cocktail from Prosecco, sparkling water and Aperol. The later has a slightly bitter orange taste. Refreshing and my go-to summer drink. We enjoyed them on the Piazza at Bar Mary. Then we went to our friends house for a light dinner. It was wonderful. 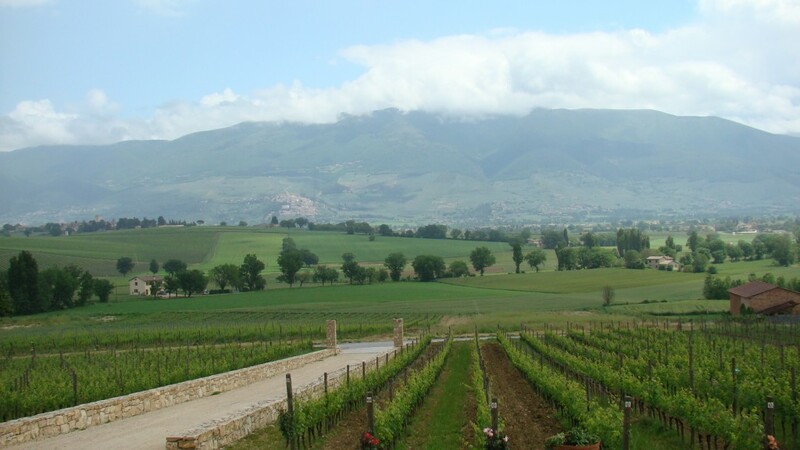 Tuesday we planned a trip to Assisi. We got an early start with breakfast and on the road at 9:30. It was great because we got ahead of the crowds and had the Basilica to ourselves. The weather was really nice. Not too hot or cold. 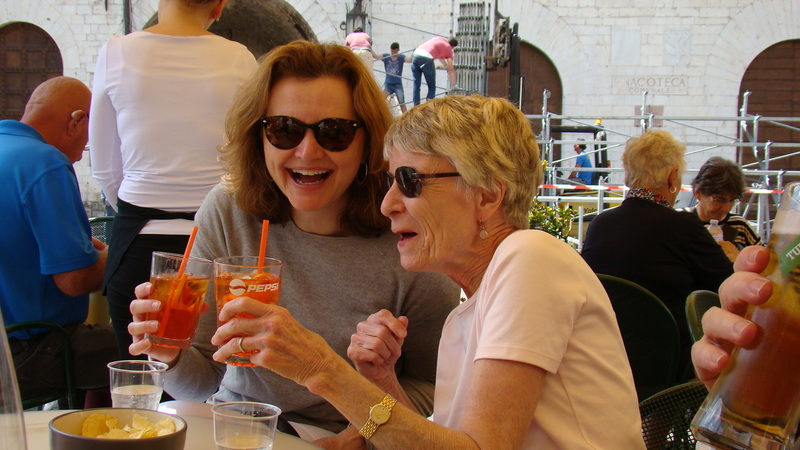 Goofing around and having an Aperol Spritz in the square in Assisi. I had been thwarted yet again by the restaurants weekly closing day so couldn’t go to the place I wanted. 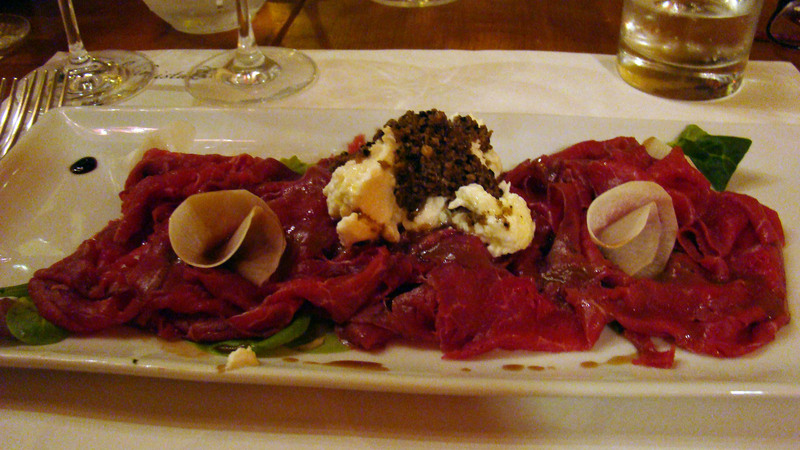 We went to a place I hadn’t tried called Osteria da Erminio. It was on a quiet square and we could eat outside. It was nice. Wednesday was market day and I wanted them to all experience it. So fun. We all enjoyed the local speciality, porchetta. It is slow roasted whole pig sliced with the cracking onto buns. Breakfast of champions! 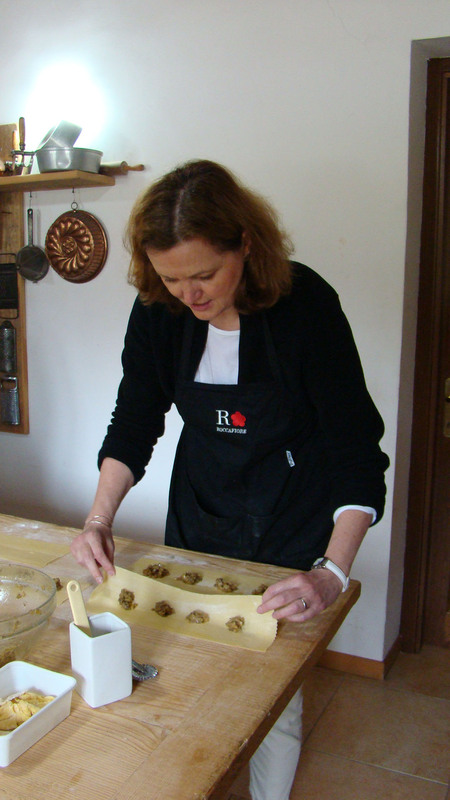 We shopped around and bought some fava beans, new peas and thin asparagus for our pasta that evening. Also fruit for breakfast. 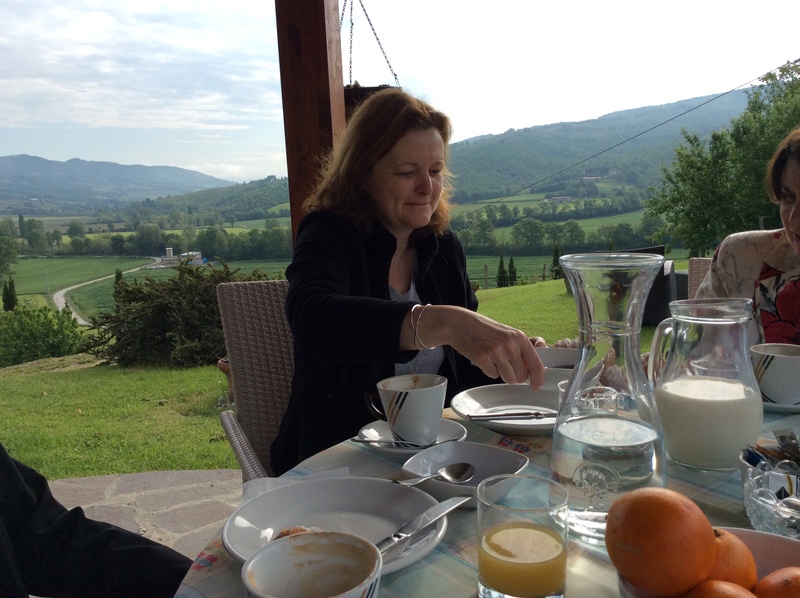 We went to lunch in Montone at Erba Luna. It is embedded in the old hill town’s walls with pretty vaulted ceilings. The food is also very nice here. That evening we had Aperols at Bar Mary again 🙂 This night we introduced everyone to our favorite Italian game show…L’Eredita. 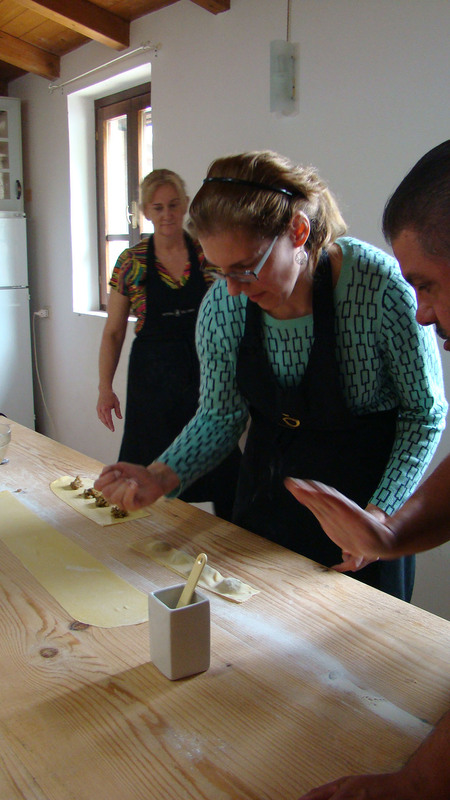 Quirky and fun and even non-Italian speakers can enjoy it with a little help from Luigi. Dinner was orchietti with the spring veggies. Tasty! 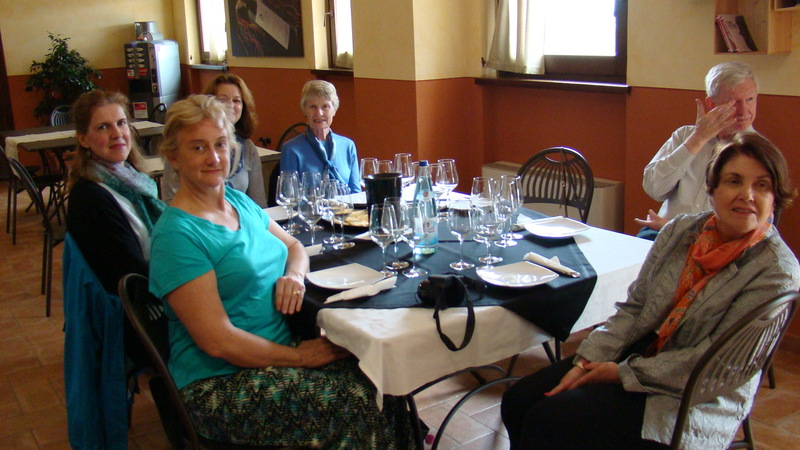 Thursday we had arranged a wine tasting at Tabarrini in the Montefalco wine region. They are nice and have a good tasting with tasty snacks to go with the wines. Luigi bought three six packs of wine. Outside it was storming across the valley. 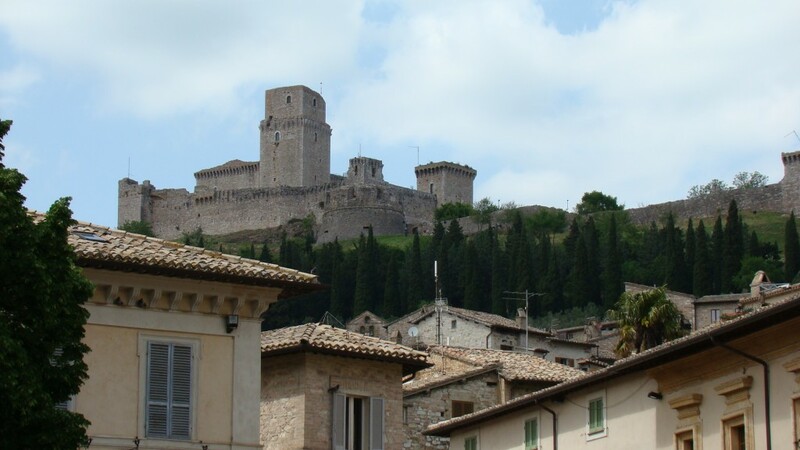 Then we headed to the hill town Montefalco for lunch at L’Alchimista. Excellent place. Too bad it was rainy so we had to eat inside. 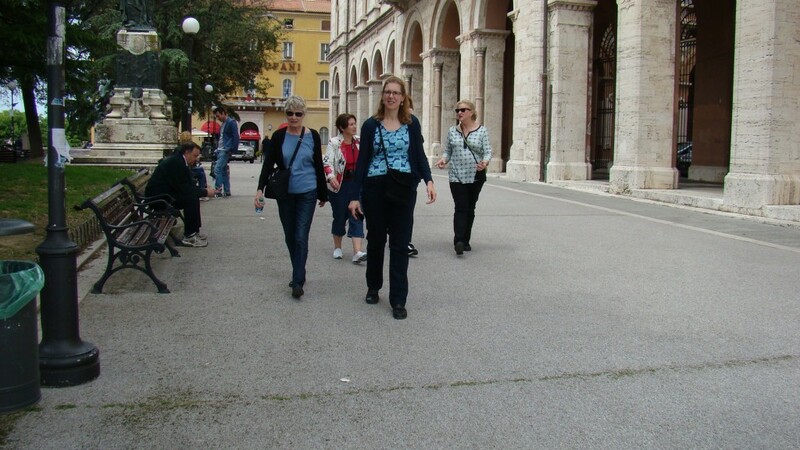 Then we went to Deruta for ceramics shopping. Most folks bought some. This evening we continued the Aperol cocktail hour at Bar Mary and the L’Eredita game show. We ordered pizza for dinner. 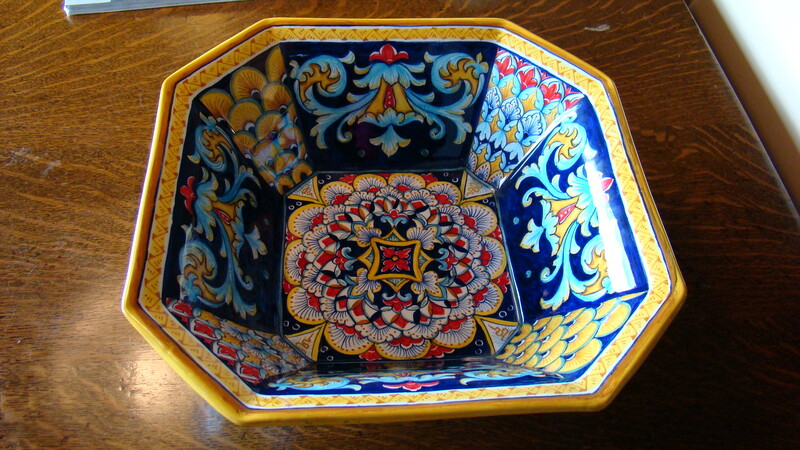 At dinner my guests surprised me with the gift of a lovely bowl I had admired in Deruta. So sweet! Alas, Friday arrived and we headed back to Roma. 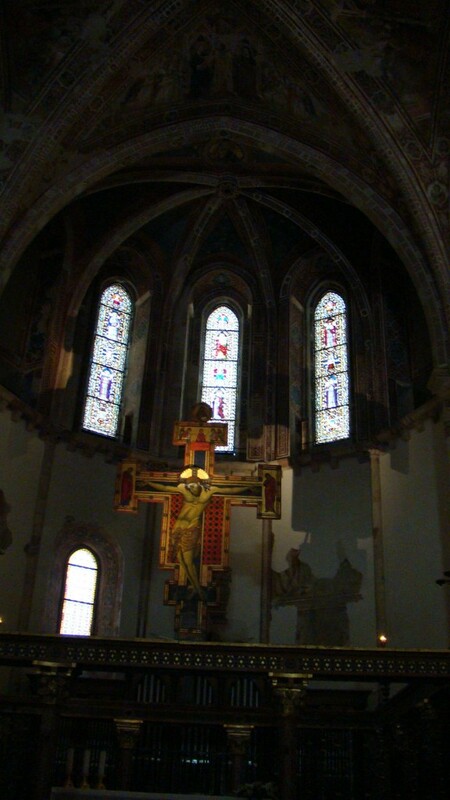 We stopped in Orvietto to see the Cathedral. It was a very windy day. We stopped at the Autogrill on the road to Roma for panini. Another Italian experience. We arrived in Fiumicino around three and checked into our hotel. We next fulfilled another necessary thing on the to-do list…gelato! Yum! Later we had our final Aperol at our hotel and watched L’Eredita for a final time and then off to dinner in our hotel one star Michelin restaurant. A very excellent dinner. More pricy than in Umbria but that’s to be expected. Saturday dawned windy and stormy. Off to the airport with our charges. Such a sad moment as I had had SUCH a great time with my friends. We kissed our farewells until a future meeting. These ladies are such a part of my life. I know they always have my back no matter how far apart we live. I love them. Buon viaggio a tutti! 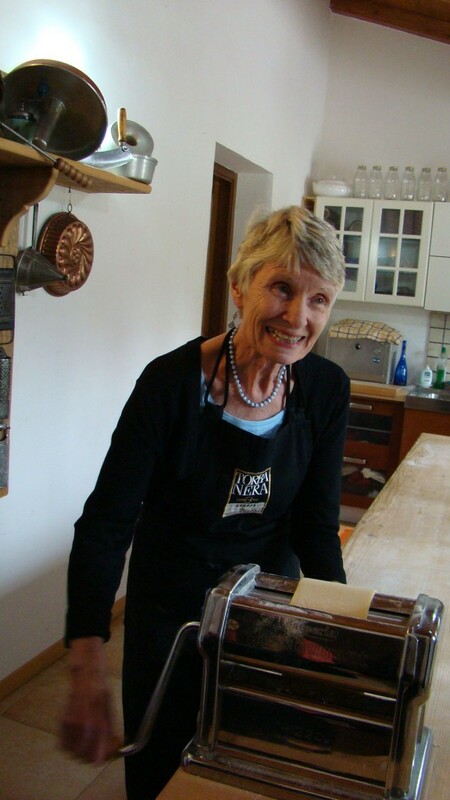 This entry was posted in cooking, Eating, everyday life in Umbria, Guests, restaurants, Uncategorized on May 15, 2016 by Nancy Hampton. Hi Nancy, What fun you all must have had. 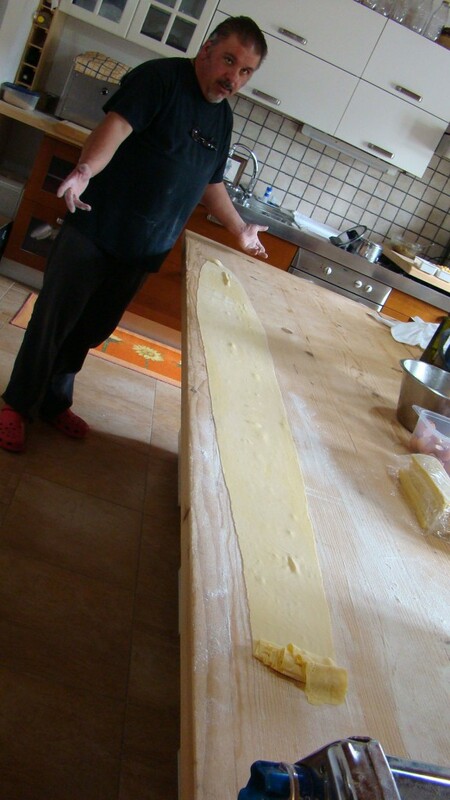 The pasta making was especially interesting for me. 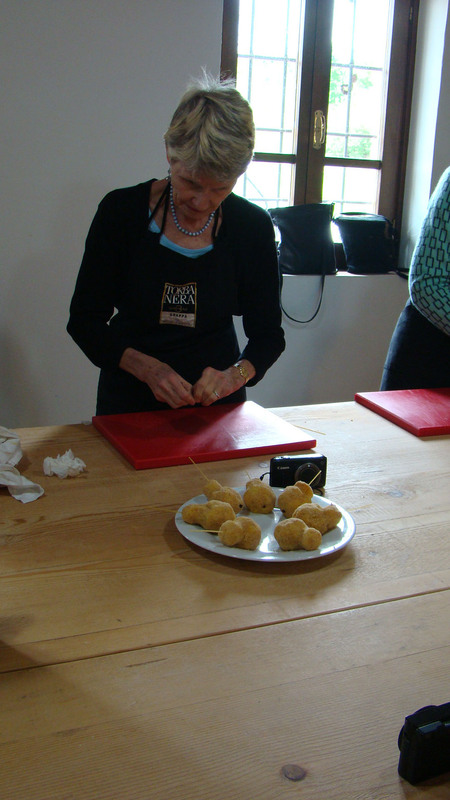 I did a similar class in Lake Garda when we were all living in Germany. Thanks for sharing it with us. 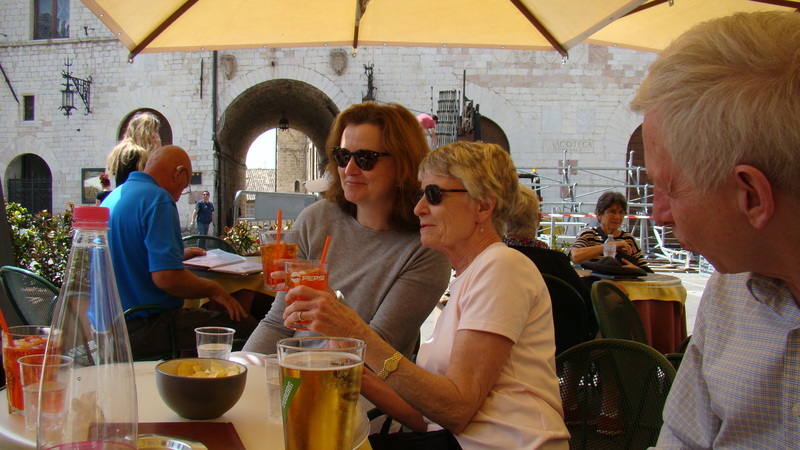 Hi Carlo, I tried to make a mix of seeing some major sights and doing some local things like wine tasting and the cooking class with time to kick back with Aperol Spritzes on the Piazza. Everyone seemed to like it. Pam even put 627(!) pictures on shutterfly. It was good to relive it all. Looking forward to you and Mary coming so we can do some of these things! Hi Jane!! So nice to hear from you. I am happy you read my posts. I do them mainly for me but like to share if anyone is interested. It’s fun living in a different culture as you know. And it keeps our brains active, which is a good thing. I hope Patrick and the children (who are all grown up I guess!) are all well. Hi to them all. I just love reading your posts Nancy. You make it look so easy living abroad. So nice your friends could visit and experience your new home with you and Luther as tour guides.